Comment about this review in the message forums. 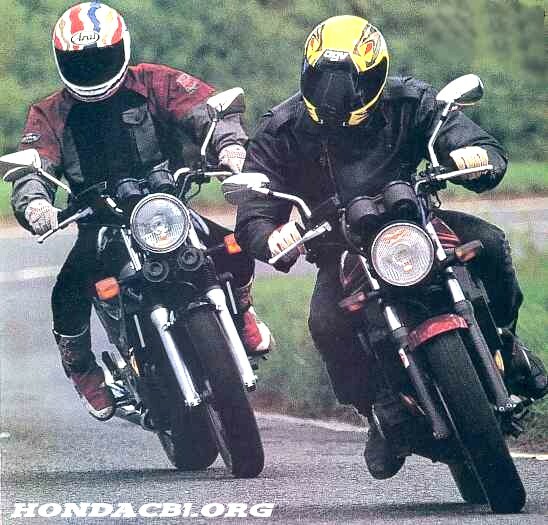 To put this test into context, the bikes the Honda CB-1 was tested against were a Suzuki 600 Bandit (the eventual winner), a Yamaha 600 Diversion (Seca II) and a Honda NTV650 Revere. Note that all the other bikes had at least a 50% capacity advantage. Great things come in small packages: Cadbury's Mini Eggs, espresso coffee and Honda's CB-1. Can it live with the big boys? 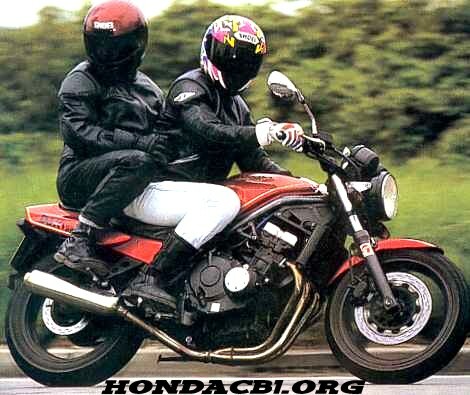 Twenty years ago Honda's original 400/4 burst into a world where a real man needed at least 650cc of wind in his flares. It was a glitter covered yet sensibly cut trouser, a scaled down superbike that sold by the boatload. Two decades on and they did it again, and this little beauty is every bit as good as its bit as good as its grandpappy. But to dismiss the CB-1 as just another retro is missing the point. It's an unfaired motorbike and that's all there is to it. It shares an engine with the CBR400, the sweetest of all the in-line 400s. It doesn't have an EXUP-type gizmo to boost the mid-range, and it doesn't need one as it pulls cleanly from 5000rpm all the way to the 13,500rpm redline. Richard F sussed it: "It doesn't feel like a 400 because the engine seems bigger. You don't need to rev the nuts off it to keep moving." 55bhp is more than enough for a small light bike It's deceptive though, and actually takes time to get up to speed. Richard F again: "It feels faster than it is and the others blow it away through long bends with their extra torque." But for new riders the CB-1 is great: the delivery's so smooth that anyone fresh from CSM's diapers could ride it without soiling anything but their licence. And I mean anyone. Honda have a knack of bestowing a Tardis-like quality on their 400s. Ronnie Corbett's smaller sister could ride one, yet three RIDE six-footers found it comfy. The pegs are low and the bars quite high which combine with the low seat so you feel like a grown-up sitting on a rocking horse but it works and I never felt uncomfy on it at all. Everyone liked it. "It feels like a smaller version of my Bandit," said Steve. That feeling intensified when it rained. It's incredible that it wasn't the English who invented fairings. Five minutes in a heavyish shower was all it took to get through my leathers on the Honda or any of the unfaired bikes on this test. There's nowhere to hide on an unfaired bike and it's enough to make you come over all miserable, which is a shame because the CB-1 is a mighty fine bike in the wet. The flat power-delivery is perfect and the chassis is every bit as responsive as it is in dry weather. And on dry roads it's pretty damn good: a bit soft at both ends for a fatty like me but well damped enough to float over bumps without throwing you off line. The steering is slow by 400 standards but thoroughly predictable, and your only worry comes if you get all butch with it and throw it into a corner like that Fogarty superbike bloke on the telly. "The first thing that scrapes is your boot unless you've got the balls of your feet on the pegs," muttered Richard E, inspecting a nice new hole in his daisies. Being a Honda, the attention to detail is lovely. "This is certainly no budget bike - the finish is top notch," said Richard F after a good poke around. We all liked it because at this end of the market there are lots of bikes that do the job, but are bland and characterless. The idea of this test was to find an all-rounder that worked well but put a smile on your face, which this bike did. Paul Tomlinson, 25, a mechanic at BAT motorcycles bought his 1990 CB-1 a year ago for "a good price". He's since done about 5000 miles on it. The highs: "I really like the look of it. I'm not really into race-reps. Plus it's a Honda so it's well made and reliable. it's fast enough for me and it handles pretty well too. I don't expect miracles from it but I've not found its limits yet. The engine's terrific, I might put some cams from a Tri-arm in it to make it a bit faster, but apart from that, I love it." The lows: "Motorways are a real slog, so avoid them where possible and that means lots of blasting round city streets which is what the CB is good for. The gearing's lower than the CBR which is fine for getting away from the lights but you lose out at the top end. Two-up it's a nightmare - slow and a bit wobbly. No thanks." The expense: "£300 insurance and that's third party only. Servicing is around £100 for a customer but I do my own. Apart from that, all I've done is stick a pair of Bridgestone Cyroxes on it. They're cheap and last for ages." For: Engine, handling, fun, build quality. Against: Softly sprung, uneconomical if thrashed. Rider: Too cosy, and the extra weight takes the edge off the performance. All right around town but make your excuses out of it. Pillion: The seat's a bit short but the pegs are OK if you're less than 5ft 8in. No grab rail means you get friendly with whoever's on the front. It's this that limits the comfort more than the seat which is actually OK. Most of the big grey importers can supply used spares. Bars are £25, a mirror is £15 and indicator £10. If you want new spares you can get them for around three times the price. Worst of all is a headlamp at £235 new and a bargain £60 secondhand. (Used prices from D+K). If you can't get a Bandit, then give one of these a try. You can get hold of them for as little as £2500, which is a bargain in our book. Just stay away from motorways and you're laughing. 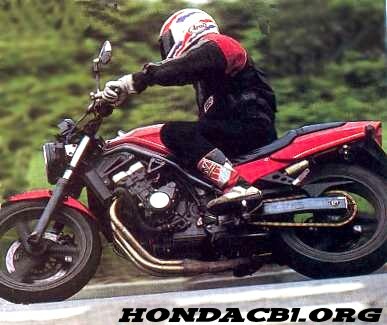 You can have tons of fun on a CB-1 without breaking the law or your collarbone. Don't be put off by the engine size, or the size of the whole thing for that matter. What do you think? Comment about this review in the message forums.